Oh how much I love you summer, I'll take your hot & sticky mosquito-ridden days over any cold winter night! How about a cute little romper perfect for a bright and sunny day, lightweight booties for a cool summer night... driving with the top down?... ooh oooh this headband should do the trick! I also wanted to thank everyone for their comments this week. Although I selfishly love reading them for myself, I think it's extra nice for the artists featured here to get your feedback. Right? I wish you all a happy weekend, see you on Monday! They're all so summery! I love it! YUM....I can see you in this, looking adorable! Awesome finds! 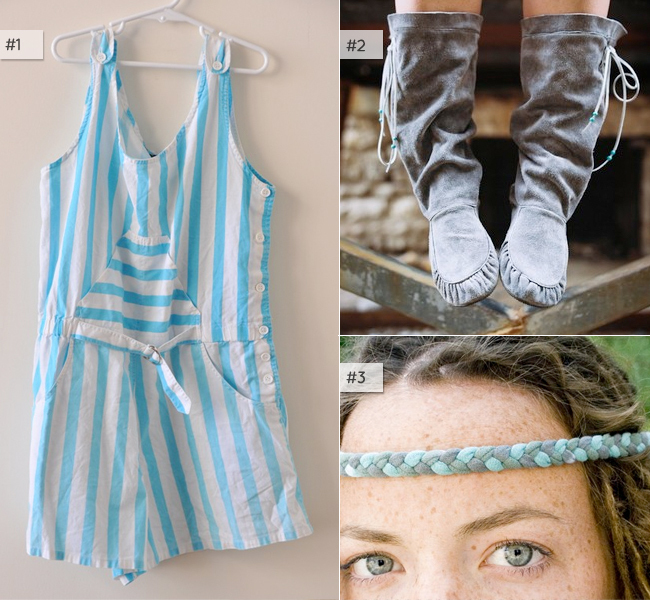 I love the stripey fun of the romper and those boots...swoon! Lovely, love the colors too. Ahhh...this is what summer is all about! I love those grey booties, and if it wasn't so (bleeping) hot down here in Dallas then they would be a perfect summer staple for me! The boots and the romper are fab picks! Love it! i just saw a tutorial on making those braided jersey headbands/bracelets!